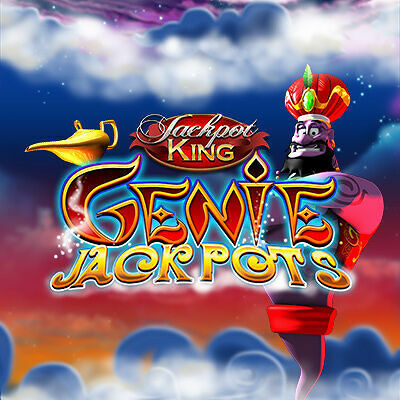 Genie Jackpots online slots casino game is a trip into magic with a genie who grants wishes. You’ll hear exotic music and the genie laughing. The reels are set against a sky filled with blue, red and purple. It’s as if you had stepped onto a magic carpet. UK based Blueprint Gaming was acquired by the German Gauselman Group in 2008. They push the boundaries in the content of their online games, making successful slots that are wonderfully engaging to play. Genie Jackpots has a 5 reel, 3 row, 20fixed payline format. The game is a jackpot game so the money bet by all the people who play the game contributes to the Jackpot which grows and grows until someone wins it. There are the usual playing cards at the bottom end of the paytable. Then, moving up through the paytable there is a genie’s hat, swords and the lamp in which the genie lives and at the top of the paytable the Genie Jackpots card. Click the three lines and then the table to view the paytable or click ?to view the game rules. Place your bet from 0.20 to 500.00. You can play auto by clickingAutoplay, selecting a number of spins, a loss limit and a win limit and then clicking start. You can stop the autoplay at any time by clicking stop. Or you can spin manually one spin at a time if you prefer. BONUS – two of these on reels 1 and 3 with a treasure chest on reel 5 triggers the mystery win bonus feature. But with a magic carpet on reel 5 they trigger the magic carpet bonus feature. TREASURE CHEST – if it appears on reel 5 and bonus on reels 1 and 3, triggers the mystery win bonus feature. MAGIC CARPET BONUS –if it appears on reel 5 and bonus on reels 1 and 3, triggers the magic carpet bonus feature. Randomly the genie appears and triggers a 3 wishes power spin. Select a lamp to reveal a prize, one of which could be the progressive jackpot. Check the paytable for full details. Triggered by two bonuses on reels 1 and 3 and a treasure chest on reel 5, the genie hit the treasure chest to reveal a cash prize. Then you pick from three lamps. If you pick the genie he’ll hit the chest again but if you pick the word collect, the game’s over. Triggered by two green bonuses on reels 1 and 3 and a magic carpet bonus on reel 5, you select a lamp to progress through the sky trail. You can keep going until you pick the word collect. Genie Jackpots is a superb game. It’s full of fun with some great bonuses to keep you spinning.